Cookies or cupcakes? Adorable character-inspired cupcakes give you the best of both desserts. You and the kids will have tons of fun decorating them. Prepare cake batter as directed on package. Add dry pudding mix, cocoa powder, violet food colour and 2 tsp. blue food colour; mix well. Spoon into 24 paper-lined muffin cups. Bake 18 to 21 min. or until toothpick inserted in centres comes out clean. Cool cupcakes in pans 10 min. Remove from pans to wire racks; cool completely. Add remaining blue food colouring to Cool Whip; mix well. Spread onto cupcakes. 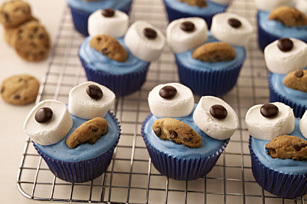 Decorate with remaining ingredients to resemble monsters as shown in photo.